We have been using Arbrux Limited Floating Fountains and Aerators for over 20 yrs. They have an outstanding product and provide excellent service. 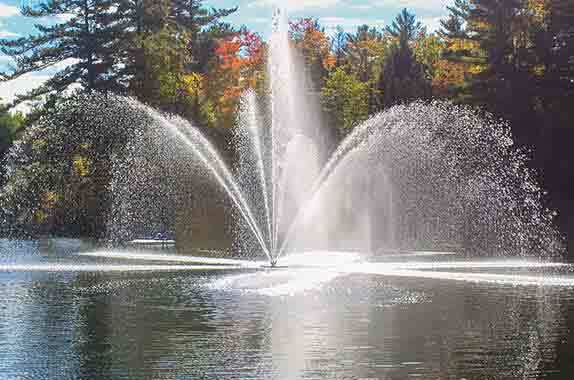 Arbrux Floating Fountains and Aerators have been a great product for Cherry Hill Golf Course. I find these products to be more affordable than others of their kind on the market. I currently have 3 fountains and 3 aerators on the course and would recommend them to anyone. We have a number of different water fountains on our course for at least 15 years. Arbrux has supplied these fountains and we are very pleased with these units…. Arbrux has always helped us out with parts and supplies.They are a definite asset to The Brudenell River Golf Course. We purchased our first half dozen de-icers from Arbrux Limited in the mid 1980’s and today these units are still in service with no repair issues. Arbrux has continually strived to improve their units through design and engineering and they are definitely the only manufacturer we recommend. We have had clients over the years that have tried other de-icers and in each case we have replaced them with Arbrux. I have been selling waterfront real estate in Muskoka for 18 years and also performed winter dock & boathouse service over that time. My clients want the best in protection for their waterfronts and Arbrux is our reliable choice to provide that. Even for cottage buyers new to the area, who wish to de-ice their own docks & boathouses, we always recommend Arbrux. Arbrux stands behind their product, their order process is quick and professional, and we will continue to expand their product base in our market. Looking forward to seeing the contrast in water turbulence compared with the longer drive structure as our two docks have no more than a four foot water depth. Thanks again for all your help and follow-up. I am impressed. We installed the fountain we purchased from you on the weekend. The install went well. I like the control boxes, big time savers and well built. The aerator is installed and we are very pleased with the way it works. We feel this is the best quality aerator we have owned (this is our fourth aerator). When we had it operational, we sat and watched it do its job! We love the way it moves the water.